When Sam Wilson became Captain America last summer, lots of heated discussions sparked off over Marvel Comics’ decision to have someone else wear the colors of their patriotic superhero. 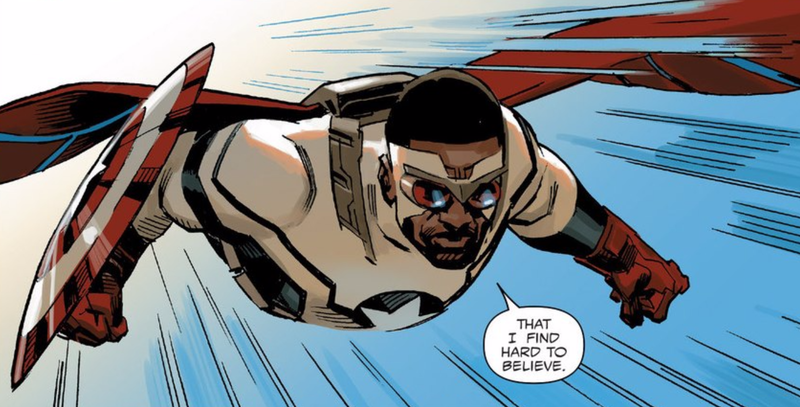 Well, even more big changes hit in the first issue of Sam Wilson: Captain America and people in the real and fictional worlds are already mad. Sam Wilson’s been Captain America for less than a year. He’s been shown learning to throw the iconic shield and learning what it means to embody the role of Captain America. The newest Sentinel of Liberty’s waged war against Hydra and help uproot the secretive terrorist organization’s foothold in various parts of American society. Up until this point, his adventures haven’t been all that different from his predecessor’s battles for justice. But in the first issue of his new comic, Sam Wilson decides to aim for a different kind of justice. That choice causes him to lose major support from the government and much of the populace. This Captain America no longer has SHIELD backing him up. In fact, when he takes down uber-henchman Crossbones and delivers him to the super-spy agency’s higher-ups, Sam gets a chilly reception and a rude revocation of his security clearance. Sam’s interior monologue talks about Steve Rogers above the fray as far as politics were concerned. The character did that because his writers did that. The new Captain America comic is being written by Nick Spencer, who’s penned a bunch of other titles for Marvel and DC along with creator-owned work like Morning Glories and Forgetless. On Twitter, Spencer is an outspoken liberal and his writing of Sam Wilson clearly evinces his own political viewpoints. It’s not hard to imagine that the shift that Sam makes with regard to embodying the symbol of Captain America is one mirrored by Spencer, as well. After all, Captain America’s been around for more than seventy years with a publishing history that’s seen all manner of upheaval on the American political landscape. It’s been rare to have comic book superheroes comment on the real world but some of the genre’s biggest characters have their roots in a desire for sociopolitical change, as in the early Superman excerpt below. There’s been precedent in the Captain America comics, too, with a 1970s run that ended with a super-conspiracy that led all the way to the White House. In that Steve Englehart-penned storyline—incited by the disillusionment created by the Vietnam War and Watergate—the head of the evil Secret Empire was then-president Richard Nixon, who killed himself rather than be captured. Sam Wilson: Captain America #1 doesn’t have moments quite as pointed as that. But it does have its lead character facing down costumed Sons of the Serpent thugs—a Ku Klux Klan analogue seen in recent Daredevil comics—as they try to stop Mexican workers from migrating across the border. Right-wing press outlets like The Washington Times have singled out this moment for criticism, saying that Captain America is now fighting conservatives. The issue ends with a page that teases a reckoning with Sam’s estranged former partner Steve Rogers. Their rift has been teased in at least one of the glimpses that we’ve had of the All-New, All-Different Marvel Universe and it’ll be interesting to see if Sam’s more activist bent of superheroing is the reason for their antipathy towards each other. You could say that this retooling of the Captain America title is a cynical grab for publicity by Marvel. But I don’t think it is. Sam Wilson is a character who’s been a social worker and run for Congress. He’s always been a superhero who tries to serve and protect his community from the ground up. And now that he’s gotten a higher profile, he’s doing the same on a larger scale. It’s a ballsy move by Spencer and Marvel but one that makes sense considering the character’s history.